Westmead Hospital’s renal physician Professor Jeremy Chapman addresses medical students at the University of Sydney today. Dozens of students have graduated from the University of Sydney’s Faculty of Medicine today. Hundreds gathered for the ceremony which took place in the Great Hall of the University of Sydney. 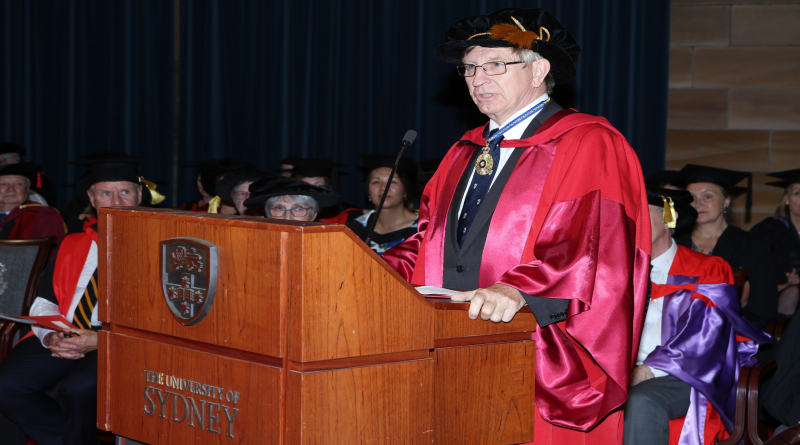 Westmead Hospital’s renal physician, Professor Jeremy Chapman addressed the students saying it was a massive achievement. “Congratulations – you have achieved a milestone in your education, hard won by you, by your family and through sacrifices to the altar of academe,” he said. “You will be the leaders in some future challenge brought on by the science of what can be done, and it is you and your colleagues who will need to decide what should be done and then make that a reality. University of Sydney’s famous sandstone campus. “I want to ask you and your families and friends to head out with confidence that your education at this university has prepared you for the work you have ahead, for leadership and for providing healthcare based on what you have learnt here, augmented by the lifetime of learning that you have ahead of you. The diversity of people in the Western Sydney Local Health District adds to the experience of medical training at Westmead Hospital. The Westmead Clinical school has a patient population of about 1.1 million. The campus at Westmead has around 1600 students who are either studying or doing clinical placements.